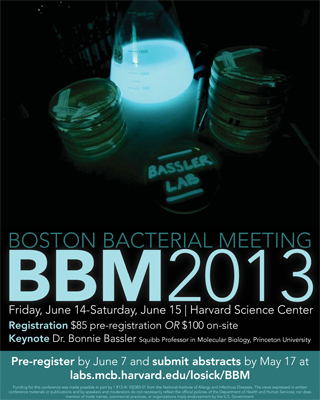 Registration is open for the 2013 Boston Bacterial Meeting! For the past 19 years, the annual Boston Bacterial Meeting (BBM) has brought together microbiologists from both academic and industrial settings in the Boston area and beyond. Last year’s BBM was attended by almost 450 researchers from over 100 labs and companies.BBM2013 will take place on Friday, June 14th, and Saturday, June 15th at the Harvard University Science Center in Cambridge, MA. We are pleased to host Professor Bonnie Bassler from Princeton University as this year’s keynote speaker. Professor Bassler is well-known for her work on the molecular mechanisms of quorum sensing, the process of bacterial cell-cell communication. We welcome abstract submissions from undergraduate students, graduate students, and post-docs from labs doing any type of bacteriology research. Abstracts can be considered for talks or posters. New to BBM this year is a poster competition. Please register by May 17th to be considered for a talk or poster, or by June 7th to attend without a presentation.